Update: Nokia 7 Plus is getting a new Android 9 Pie Developer Preview 4.1 OTA update based on Nokia Lab’s Beta 4.1 with firmware build number V3.190. This is the final version of Android P for Nokia 7 Plus. The next OTA update will feature a stable build for the same. So stay tuned. Meanwhile, download and install Nokia 7 Plus B2N-3190-0-00WW-B03 OTA update with various optimizations. Previous update: Google released official Android 9 Pie firmware update for Pixel devices. Soon Xiaomi and Essential started rolling out similar OTA update for their flagship phones including the Mi Max 2S and the Essential PH-1. Today, Nokia’s twitter handle posted about Android 9 Pie. However, it is only the final Developer Preview 4. The latest Android 9 Pie OTA update for Nokia 7 Plus comes with a new firmware build number V3.150. Currently, it seems, the update is live only for the international variants TA-1046, and TA-1062. The OTA weighs around 1.4 GB in size. So download and install Nokia 7 Plus Android 9 Pie OTA update. What’s new with latest Android P DP 4.1 v3.190? It may wipes the device. So backup! What’s new with latest Android P DP 4 v3.150? Following are the OTA update and full stock firmware updates. The following OTA update have been captured by Nokia 7 Plus users. Thanks to edwaine for the collection. These OTA update are for the international and Chinese variants TA-1046, TA-1062, and TA-1055. The following is the stable channel still based on Android 8.1 Oreo. These are the full stock firmware that can also be sideloaded as OTA updates. The following is the Beta channel and has been updated to Android 9.0 Pie. To get into the Beta channel, you may need to sign up as a developer (see below). These are the full stock firmware that can also be sideloaded as OTA updates. How to Update Nokia 7 (Plus) to Android 9 Pie? There are multiple methods to get the latest Android firmware update. Option 1: If your device is already on the Android P Beta channel, you will receive and OTA update. Option 2: However, if your device is on the Android 8.1 Oreo stable channel, then you can flash the OTA update from 1 to (n) in priority. Read: How to install OTA updates on Nokia? The upgrade procedure for Android 9 Pie is being rolled out via Beta channel. You can register to be a Beta tester and receive the official Android 9 Pie as soon as it is released. All you need to do is sign up using email or social account and enter your IMEI number to get OTA notification. Note: Downloading of Android 9 Pie Beta Upgrade is only available via Wi-Fi connection. 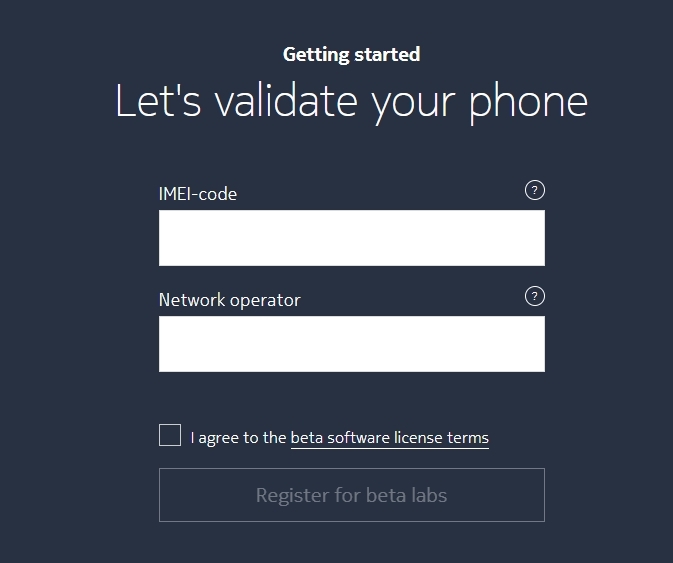 First, visit BetaLabs link and sign up as a Nokia member. Sign up using Facebook or Google+ or your email address. Later, input your device’s IMEI number and Network operator. Agree to terms and register for beta labs. Once your applications is approved, you will receive an OTA update. If you want to revert back to Android Oreo from Beta channel, you will need the Rollback package. The official So you can still update to Oreo Beta once the enrollment has ended. So stay tuned.